Gaming After 40: Ultravision: The Ultimate in Vaporware! 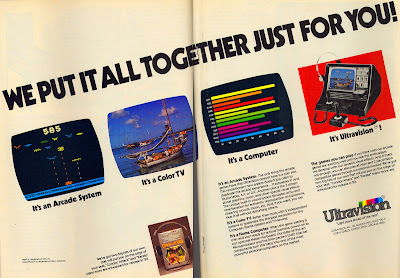 Ultravision: The Ultimate in Vaporware! The Ultravision Video Arcade System was announced at the 1983 Consumer Electronics Show. It was meant to be the ultimate in home consoles-slash-computers. It was even advertised for a few months by its manufacturer, Miami-based Ultravision, Inc., before it disappeared without a trace. 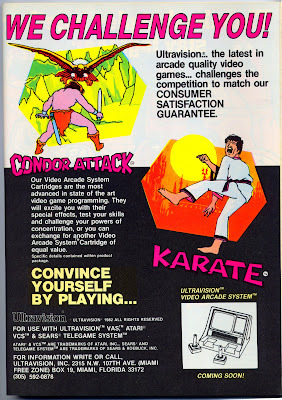 The company's ad in the November 1982 issue of Electronic Games magazine featured this teaser mention -- next to their "consumer satisfaction guarantee" promo for its Atari 2600 games Condor Attack and Karate, there's a tiny drawing of the Ultravision Video Arcade System - "coming soon!" Note that the Atari 2600 games Ultravision is promoting are supported by a "consumer satisfaction guarantee" -- which as documented here consists of allowing the dissatisfied customer to exchange the unworthy product for another Ultravision game. Good news if the other one is better... or actually comes out. More on that later. It sounds pretty good, actually. It has all the advanced features any 1980's gamer could want -- a headphone jack, built-in TV screen with tuner, AC/DC power options for portability, and full compatibility with the Atari 2600 and Colecovision via an external module. The home computer side of the system has 64K of RAM, a "state-of-the-art Microprocessor" and can be activated by the optional Master Keyboard. It's also slated to host its own line of super-advanced coin-op quality game cartridges with "dynamic visual effects" including three dimensional graphics and zooming. But there are some suspicious omissions here. 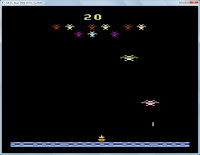 Why does the only pictured game, Condor Attack, look just like the Atari 2600 version? (Actually, the drawing used in the ad looks a little better than the real thing, but you see my point.) Why are the advanced computer capabilities illustrated by an artist's rendering of a bar chart? Why does the "photo" of the unit look suspiciously like an airbrushed promotional image with a cut-and-paste TV picture inserted, rather than an operating unit running software? Time went on, and the Ultravision ads disappeared. No price point was announced, no more convincing images of the console appeared in the magazines, no Ultravision-specific games were promoted, and the system certainly never shipped. I'm not sure an operating model was ever shown in public, and the Video Arcade System may not even exist as a prototype. It may have been a casualty of the crash, but even if the industry hadn't tanked, it looks more like a case of big dreams with insufficient financing. As the industry downturn kicked in a year or so later, I'm sure there were a few investors thanking the gods that they didn't pour any cash into Ultravision, Inc. 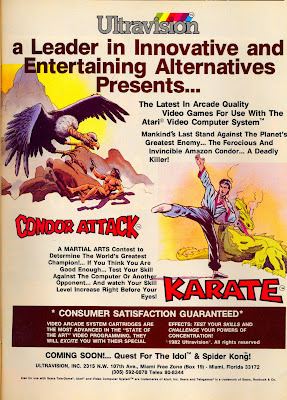 The company did complete the first wave of games it had promised and advertised, but they were mediocre even by Atari 2600 standards -- Condor Attack actually came out in stores, and proved to be a shoddy Demon Attack clone. And despite the months of advertising, Ultravision's second game, Karate, was never released in commercial quantities, though it was later picked up for distribution by Froggo Games during the 2600's brief NES-era revival. Spider Kong apparently became 20th Century Fox's Spacemaster X-7, among other titles, and Quest for the Idol was never seen in any form as far as I can determine. The advanced Ultravision versions, meanwhile, appear never to have made it to the screenshot stage, let alone an EEPROM manifestation. Public Enemy said it best: Don't believe the hype. There's nothing more fascinating than vapourware IMHO, or anything close to it. In the UK, I thrilled to the news as a child concerning the Konix Multisystem. I still have the magazines from the time, and ACE magazine seemed to be aware from quite eary on that this was never going to happen, dropping ominous hints in their previw articles. Never heard of this one before. Damn interesting - thank you, sir.